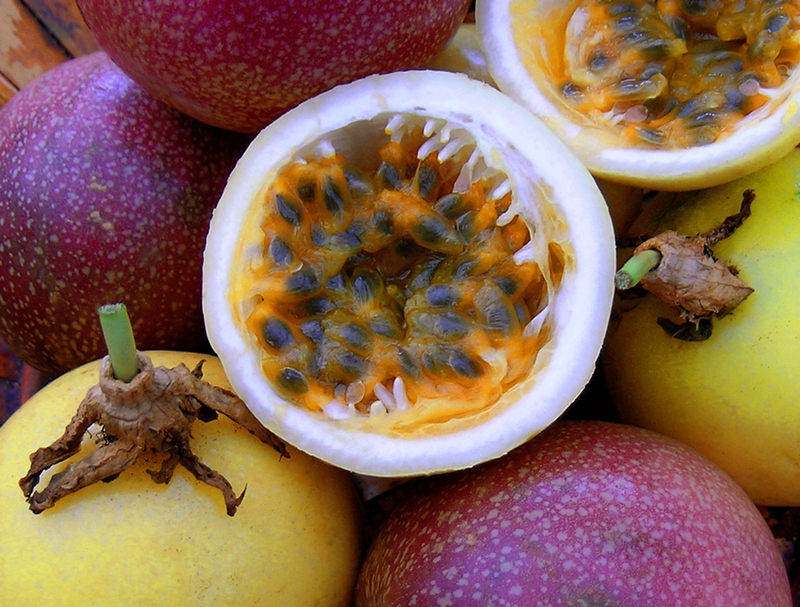 There are two distinct forms of passion fruit, the standard purple, and the yellow, called liliko'i in Hawaii. 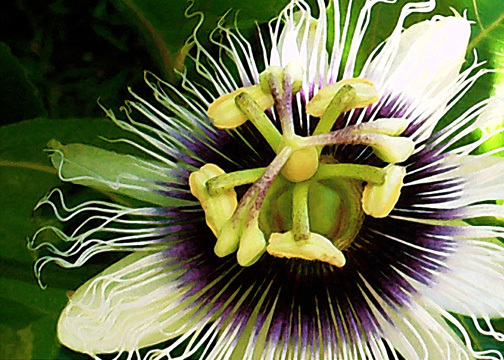 Seeds of the purple passion fruit, brought from Australia to Hawaii, were first planted in 1880 and the vine came to be popular in home gardens. It quickly became naturalized in the lower forests and, by 1930, could be found wild on all the islands of the Hawaiian chain. In the 1940's, a Mr. Haley attempted to market canned passion fruit juice in a small way but the product was unsatisfactory and his effort was terminated by World War II. A processor on Kauai produced a concentrate in glass jars and this project, though small, proved successful. In 1951 the University of Hawaii chose this fruit as the most promising crop for development and undertook to create an industry based on quick-frozen passion fruit juice concentrate. From among Mr. Haley's vines, choice strains of yellow passion fruit were selected. These gave four times the yield of the purple passion fruit and had a higher juice content. By 1958, 1,200 acres were devoted to yellow passion fruit production and the industry was firmly established on a satisfactory economic level. The photo to the right shows the exotic flower of the yellow passion fruit, which is about 3 inches across. They have five white petals that form the base, which has on top a vivid purple streaked and dotted center. Coming up from the center are five bright yellow stamens with large ends and shooting outwards from the center are very fine, whitish 'hairs' to complete this bizarre but beautiful flower. The nearly round or oval fruit, 1 1/2 to 3 inch wide, has a tough rind, smooth, waxy, ranging in hue from dark-purple with faint, fine white specks, to light-yellow or pumpkin-color. The rind is 1/8 inch thick, with a 1/4 inch layer of white pith. Within is a cavity more or less filled with an aromatic mass of double-walled, membranous sacs filled with orange-colored, pulpy juice and as many as 250 small, hard, dark-brown or black, pitted seeds that are edible. The one-of-a-kind tropical flavor of the juice is tart, and acid. Though not native to Hawaii, liliko'i has become a local favorite, especially when added to other foods. Eaten fresh off the vine, it is high in vitamin C, potassium, beta carotene and fiber. Baked, squeezed, frozen or preserved, it is turned into a variety of tasty confections (liliko'i butter, jelly, pie, cookies) and refreshing drinks (smoothies, iced tea, and cocktails). For the recipes below, if you can't find fresh liliko'i, try passion fruit concentrate which can be purchased online at http://www.amazon.com/Culinary-Traditions-Passion-Fruit-Concentrate/dp/B0001T2L5M/ref=pd_sim_gro_3. 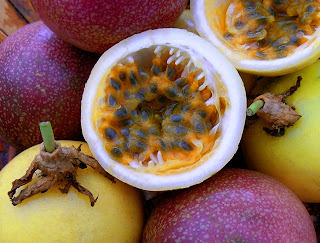 I have heard that many Asian or South American markets carry passion fruit concentrate, but I have not tried it. Scoop the seeds and pulp from the liliko'i with a spoon, and press it through a fine-mesh sieve. Reserve the juice (about 1 tablespoon) and discard the seeds and pulp. Put the shrimp in a small bowl, and toss with the olive oil to coat. Set a dry stainless-steel sautée pan over high heat and, when hot, add the shrimp. Sear, turning often until evenly pink, about one minute. Transfer to a nonreactive bowl, and add the reserved passion fruit juice, onion, tomato, scallion, cilantro, Tabasco sauce and salt and pepper to taste. Toss well to combine. Cover and refrigerate. Serve salsa in two ripe avocado halves as an appetizer, or spoon over your favorite sauteed fish, letting the juices from the salsa run onto the plates. Makes 2 servings. Cut liliko'i in half. Scrape pulp and seeds into a small saucepan. Heat fruit pulp over medium low heat, stirring. Heat almost to boiling, then remove from heat. Strain pulp through a fine sieve. Discard seeds, and let the juice cool. Place olive oil, liliko'i juice, lime juice, vinegar, honey, and salt in a blender or food processor. Blend until smooth. Stor salad dressing in refrigerator for up to one week. Stir or shake before using. Great served over a fresh fruit or vegetable salad. Also wonderful served warm over grilled chicken. Makes about 3/4 cup. Preheat oven to 350˚F. Cut butter into 1/2-inch pieces. In a food processor mix until all ingredients combine to form a gravely texture. Spread into a 13 by-nine-inch baking dish. Press evenly onto bottom with the palm of your hand. Bake 20 minutes. While shortbread is baking, prepare custard. Once shortbread is done, reduce oven temperature to 300˚F. Whisk together the eggs, sugar, liliko'i juice, lemon zest, lemon juice, and flour. Pour over the shortbread crust and bake for 30 minutes, until the filling is set. Let cool completely in pan and cut into 24 bars. Sift confectioners sugar over bars. Boil water and sugar in a saucepan over medium heat for 5 minutes. Add liliko'i juice and lemon juice and boil for 3 minutes more. It will boil rapidly and expand, so keep an eye on it at this point. When the glaze turns into a thick, sugary syrup, drizzle over the liliko'i bars. Makes 24 bars. Cut fresh liliko'i in half with a serrated knife and remove the pulp, juice and seeds with a small spoon. Heat in a small pot until almost boiling. Press pulp through a strainer and discard seeds. Cool liliko'i juice. Blend together the eggs, coconut milk, and cooled liliko'i juice in a small bowl. Whisk together the sugar, flour, and salt in a large bowl. Add the liliko'i mixture to the sugar mixture and whisk until smooth. Pour over the shortbread and bake for 16 to 18 minutes, or until just set. Let cool to room temperature. Using the parchment paper, lift the bars out of the pan and transfer them to a cutting board. Dust with plenty of powdered sugar, cut into portions, and serve. Makes 12 large bars. Bars keeps for a couple of days tightly sealed in the refrigerator. In a large bowl, cream the butter and sugar until light and fluffy. Beat in the egg, sour cream and passion fruit juice. Combine the flour, baking powder, baking soda and salt; stir into the creamed mixture just until moistened. Fold in the pineapple, coconut and nuts. Fill greased or paper-lined muffin cups two-thirds full. Bake at 375° for 22-25 minutes or until a toothpick comes out clean. Cool for 5 minutes removing from pan to a wire rack. Yield: about 1 dozen. Preheat the oven to 325˚F. In a large bowl, combine the crumbs, sugar, and butter and stir until well blended. The mixture should stick together when squeezed firmly in your hand. Transfer the Graham-cracker mixture to a 9-inch springform pan and press the mixture firmly onto the bottom of the pan. Bake until golden brown, about 8 minutes. Remove from the oven and let it cool. For the filling, in the bowl of a stand mixer, beat together the cream cheese, mascarpone cheese, powdered sugar, and vanilla extract until thick and creamy. Add the eggs, one at a time and continue mixing until the mixture is well blended. Add the liliko'i pulp, without seeds, and continue beating, scraping down the sides of the bowl as needed. Add the sour cream and beat for another 5 minutes. Pour the filling into the springform pan and bake in the oven for 45 minutes. It might still jiggle a bit. Let it cool for 10 minutes. For the topping, combine sour cream, sugar, and vanilla extract and beat until the mixture becomes creamy. Pour the sour cream mixture on top of the filling and bake until the top is firm but still soft to the touch, about 15 minutes. Remove the cheesecake from the oven and let it cool for 30 minutes. Transfer the cake to the refrigerator and chill overnight. For the syrup, place the sugar, water, and liliko'i pulp in a saucepan over low-medium heat and boil until the mixture volume is halved or until syrupy, about 20 minutes. To serve, run the edge of a warm knife along the inside edges of the springform pan. Remove the cheesecake and top with passion fruit syrup. Makes 8 servings. To juice the liliko'i remove all pulp from all the fruit. Place in blender and pulse for 5 to 10 seconds. Pour in a fine mesh strainer placed over a bowl and with the back of a spoon push the pulp around until you are left with just the seeds in the strainer. Place all the ingredients in a food processor and process until well blended. Pour the mixture into a metal or plastic bowl and freeze. When frozen, break up the ice and place a small amount at a time into the food processor. When whipped and frothy, return to the bowl and freeze again. This mixture will not freeze hard and solid, so it will be easy to scoop out to serve. Sprinkle a few of the reserved seeds over the top of the ice when it is served or they may be added when the ice is returned to the freezer for the second time. Makes about 5 cups. Note: Liliko'i juice can be made in advance and frozen in ice trays then transferred to freezer bags for future use. Chop 4 of the starfruit, put in food processor and puree. Strain the pureed fruit in a fine strainer to get all of the juice out of the starfruit without the pulp. Use a spoon to push the fruit through the strainer. Whisk in the sugar, orange zest and vanilla extract. Cut the fresh liliko'i in half and with a spoon, scoop out the juice and seeds and add both to the mixture. Add the milk, whisk, then place the mixture in the refrigerator for 1 hour. Pour the mixture into your ice cream maker and churn until frozen, about 1/2 hour. Scoop out the sherbet into a plastic container and continue freezing about 3 hours, or until hard. To serve, place one or two scoops of sherbet into 4 dessert glasses or martini glasses and garnish with a slice of starfruit. Makes 4 servings. To prepare yogurt, place a sieve over a medium bowl and line the sieve with two layers of cheesecloth. Scoop yogurt into the sieve, cover, and refrigerate for 6 to 8 hours (liquid will drain from yogurt). Discard liquid and measure 1 1/4 cups strained yogurt. Set yogurt aside for use in base. To prepare liliko'i syrup, once again set a sieve over a medium bowl. Cut each liliko'i in half and scoop every last bit of pulp and flesh into the sieve. Using a spoon or spatula to push the fruit through the sieve, separating the seeds. Once strained, measure 1/2 cup liliko'i pulp. Set a small saucepan on the stove and add pulp and 3 tablespoons sugar to the pan. Bring to a boil over medium-high heat, stirring occasionally. Heat until sugar is dissolved then remove from heat. Let cool completely. To make the frozen yogurt base, begin by mixing 3 tablespoons of the milk with the cornstarch to make a slurry. In a large bowl, whisk the cream cheese until smooth. Set a fine mesh sieve over the bowl and set aside. Fill a large bowl with ice water and set aside. Combine the remaining milk with heavy cream, remaining 2/3 cup sugar, and corn syrup in a large saucepan. Bring milk mixture to a boil. Cook over moderate heat until the sugar dissolves, 4 minutes. Remove from heat and off the heat gradually whisk in the cornstarch mixture. Return to a boil and cook over moderately high heat until the mixture is slightly thickened, about 1 minute. Gradually pour the hot milk mixture (through the sieve) into the cream cheese and whisk until smooth. Pour reserved 1 1/4 cup strained yogurt and liliko'i syrup. Whisk until smooth. Set the bowl in the ice water bath and let stand, stirring occasionally, until cool, about 20 minutes. Chill the mixture thoroughly (at least 4 hours or overnight). Once chilled, pour into an ice cream maker and freeze according to the manufacturer’s instructions. Place plastic or parchment over ice cream (to prevent ice crystals) and freeze until firm, at least 4 hours. Makes one quart. Add passion fruit juice and rice flour into a microwave safe bowl like pyrex. Mix until combined, then cover tightly with plastic wrap and microwave for 3 minutes on high. Carefully remove plastic wrap and stir - the center should be slightly liquidy and the edges stiffer. Cover again with plastic and microwave for another 2 minutes. Remove from microwave and stir. You should now have a 'dough'. Dust a cutting board with cornstarch and turn the dough out onto the board. Wait about 30 seconds to 1 minute, until the dough is cool enough to handle. Dust the top of the dough with cornstarch and form into a 1.5 inch thick log. Cover loosely with plastic wrap (keep covered to prevent from drying out). Cut off a 1.5 inch piece and form into a flat circle (make sure your hands are well starched so the dough doesn't stick). Place some cubed mango in the center of the dough and pinch closed. Place each mango-mochi, with the pinched side down, in cupcake liners and dust with powdered sugar. Makes 1 dozen pieces. Note: This mango-mochi is best made the same day that they will be eaten, otherwise the mochi might dry out and start to get hard. Hawaii is famous for its lilikoi curd, or lilikoi butter as it is called here. Great on toast, biscuits, sweet bread, or muffins. In a saucepan over medium heat, add butter and honey. Stir with a whisk until butter is melted and mixture is combined. Mix together the lilikoi pulp (juice), and beaten eggs in the bowl. Gradually add to the butter/honey mixture, stirring continuously with a whisk until the mixture thickens. This should take about 10 minutes over medium heat. Do not allow the curd to boil or it will scramble the eggs. Allow the lilikoi butter to cool at room temperature before pouring into an airtight glass container for storage in the fridge. Note: Some people leave the seeds in the butter, but I don't like to eat the seeds, so I strain them out.